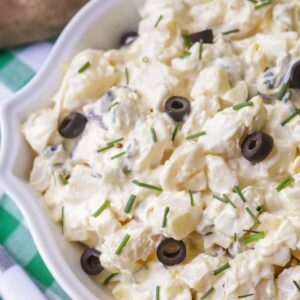 Our all-time favorite Potato Salad - it's simple, flavorful and filled with chunks of potatoes, eggs and olives! It's the perfect addition to any BBQ or picnic and is so creamy and tasty, it will wow everyone who tries it. Place your potatoes in a pot and bring to a rolling boil. Boil potatoes for 40-45 minutes or until tender (a knife should easily pierce a potato). While potatoes are cooking, boil your eggs. Peel them and set aside. Let potatoes cool. Peel off skins and cube your potatoes. It's okay if they are soft or fall apart. Place in a large bowl. Cube eggs and add to bowl. Cut olives and desired amount of pickles (we used 3) into small pieces as well and add to your bowl. Add your mayonnaise and mustard and mix well (add more or less mayonnaise depending on what you like). Add salt and pepper and mix well. Refrigerate until ready to serve. (We like to make this the day before and let it refrigerate for 18 - 24 hours).